This permanent exhibition was designed to remember that the large majority of prisoners were deported to Ravensbrück by train. The central exhibit is an historical German Reichsbahn train which is biaxial with a covered box wagon. The train comes from the railroad museum in Röbel/Müritz. There are 14 information boards in front of and behind the train car with text passages and images. The first part of the exhibition provides a summary of the chronological structure and origins of the transports to Ravensbrück and explains what the different kinds of trains were and where they arrived, as well as the relationship of the residents at the time to transports arriving in the city Fürstenberg/Havel. It gives information about the train tracks around the camp, the role of the German Reich railroad system in the deportations as well as the restoration of the train cars set up here. The second section is a presentation of how the pattern of the transports to Ravensbrück changed between 1939 and 1945. Furthermore, the visitor can also get information about the deliveries of captured goods, about transports to working areas outside of the camp and to the extermination camps as well as the evacuation transports from other concentration camps. The last two information boards tell about the trains that the freed prisoners used to get back home. 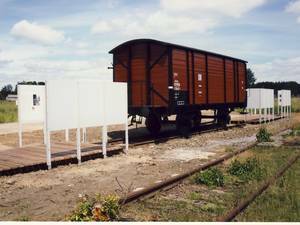 The train car and the exhibition are located in front of the historical “captured goods barracks”, about 800 meters away from the entrance to the memorial site on the southern edge of the camp. Countless train cars with goods stolen from the occupied countries were conducted along the former train tracks to the partly conserved, historical ramps in front of the wood barracks (the rails had been renewed after the war by the Red Army). The prisoners had to unload the train cars here and bring the materials into the “captured good barracks”. Photo: Brandenburg Memorials Foundation/Ravensbrück Archive. Photo: Britta Pawelke, Fürstenberg.